Love to you this Monday, my dear readers. Thank you for all the sweet words and prayers after my sweet pup passed away last week. It's still stings, but the Lord surely is faithful to mend our wounds and heal our hearts. "Erin - You are going to be OK, because...."
Be encouraged this week, my dear friends. Your life matters and your heart is a gift to this world. Remember, it's all going to be OK with Jesus. What are some of the verses that encourage you the most? Sweet Erin, thank you from the bottom of my heart for sharing these verses. I know I will look back at this post and find those verses when I'm overwhelmed. ....AND, I'm just so thrilled for you!! Keith Urban! Woohoo! That's so exciting! Especially for a country lovin' gal who's in need of some fun and stress relief. God knows just how to touch our hearts, eh? So happy for you, Erin. Love all of these verses!! These are definitely a blessing and I plan to copy these into my journal tonight! Thank you for passing these on! Some of my favorite ones recently are: Psalm 91, Job 36:15, Pdalm 147:3, Psalm 34:18, and salm 126:5. 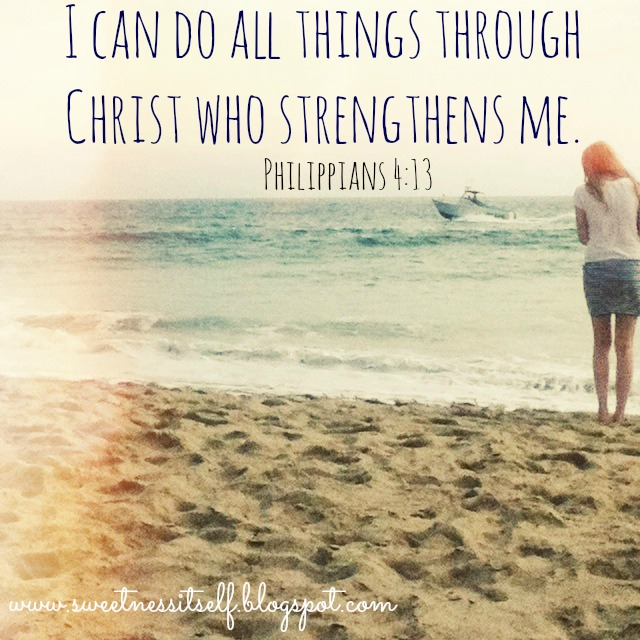 I've been using the verse as you posted "I can do all things thru Christ who strengthens me." Wow...Keith Urban and for free. What a great opportunity. I bet he kicks some aussie booty. LOL :D have fun girl. You deserve it. I always look forward to reading your blog and I always leave feeling encouraged and helped. Thanks so much! It means alot to have someone who is so encouraging and uplifting thru Christ. Gosh, congrats to your parents on 30 years and raising a beautiful woman. You are so true, I need your posts. Oh Erin, you always give the best encouragement and love! These verses are great picks– I'll definitely be highlighting them or putting them on my own scrap of paper sometime :) Also, I love that little story you shared about the tickets– God is SO good! Hi beautiful. This post was exactly what I needed to hear. It's crazy how the Lord uses you to speak specifically to so many people. My favourite verse is Psalm 55:18. Thanks for the encouragement, darling sister! what beautiful promises of the Lord always being close to us in time of sorrow and difficulty. He is such a beautiful God! i love the first verse. psalm 34:18.
you have a beautiful heart for the Lord! I'm so excited for you about the Keith Urban show! I saw him a few years back, and loooved it! And girl, I just want to say that I love your heart so, so much. And I cannot wait to meet you :) Sometime in June perhaps? Such encouraging verses! Thank you for sharing your walk. Just read these verses again and am feeling much better. Thanks, Erin. Love you so much, Darlin. I believe all these verses speak to my heart and I needed to hear every single one. However, "Those who seek the Lord lack no good thing." -Psalm 34:10b" basically summed it all up! This was a great reminder for this season in my life! I love this so much. You are so inspiring.